Christians in Context: from orthodoxy to orthopraxy. : The Soup Nazi would have made a great pastor. I'm finishing up a book called "Selling Out the Church" by Philip D. Kenneson and James L. Street (Cascade Books, 1997). I picked it up last year at ETS and haven't had time to read it until now. It is a pretty quick read and worth the time. The authors do a few things that are especially helpful. First of all, they provide a clear, concise picture of how our whole culture has become a marketing culture. They say that we have gone through the following cycle: production, sales, marketing. In the production period (up to about the 1920's), companies produced quality goods and people had to come to them to buy them. In the sales period (through the 1940's), companies produced goods and then sent out salespeople and advertisements to sell the goods. In the present period, the marketing period (through the present time), companies find out what the customers felt needs are and then they produce something to meet them. The church is a business of sorts: a religious organization that creates "spiritual profit" by offering certain "products. The church is an instrument to achieve other ends. We ask of the church: what is it good for? That is, the view of the church is very, very pragmatic. The church is a means to an end, and we market it as so: it helps our family be stronger, it offers an experience of community, it gives us a sense of meaning so we can feel happy. This idea of the church meeting predetermined needs is why we get all caught up about a church being "relevant." This is why the church is increasingly viewed as a "full-service" organization designed to, in the words of Barna, "be responsive to the needs of their members and constituents, and repsonsive to the needs of society." Barna goes on "A responsive congregation is one that makes ever effort to sense, serve, and satisfy the needs and wants of its members and participants within the constraints of its budget." The church must be novel. We live in a culture of "planned obsolescence," and so the church must always be reinventing itself and changing to conform to people's newly realized "felt needs." The church can be engineered through proper techniques. Church marketers, though they make comments to the contrary, leave no room for the church to be a miracle of the Spirit. Instead, in true Western fashion, we engineer everything. I love the question: "if God ceased to exist today, could your church go on functioning and growing normally?" If the answer is yes, you don't have a church. The church should be homogenous. Marketing means you are aiming to meet "felt needs." Church marketers are unanimous that you must "target" your marketing, meaning that you are going to market to a certain niche of people's felt needs. As a result, the church can't help but be homogenous in some sense. Finally, the authors make the simple-yet-profound point that if we cater to felt-needs we have a significant problem: what do we do when those needs are wrong? Indeed, the authors assert, we are guaranteed that their felt needs will be wrong, since humanity is fallen and in no shape to determine their needs. The result is that a church who attracts people through catering to their felt needs must continue to satisfy the felt needs (protecting my wealth, making me feel good about myself, fostering my nationalism, et al.) and never address the real needs (needs for Jesus, repentance from sin, faith in God, generosity, humility, etc.). Or, the church can lure people in through marketing and, all of the sudden, turn on them and tell them that their felt-needs are illegitimate and ludicrous. This will usually result in disappointed and bitter people. I could go on and on and on, but all this brings me to my conclusion: The Soup Nazi would have made a great pastor. You see, the Soup Nazi had something to give to the world; namely, soup. And the Soup Nazi knew his soup was good, and he knew how it should be prepared, he knew what is should come with...you get the picture. And when people came in and started whining about it, he simply said, "No Soup for You!" I mean, before anyone thinks I'm saying pastors should be mean and demeaning, I'm just joking. But seriously, as I think about my future life in ministry, I think the Soup Nazi is going to be an ongoing hero of mine. He knew his calling, he defined the needs, and he met the needs in the way he saw fit. I've got to know my calling: to preach and model the gospel, to confront myself and others with the truth of God so that we can submit in the confrontation and be changed by God into what he wants us to be. I've got to define people's needs for them: part of being a pastor is pointing out that their "needs" for comfort, fun, and wealth are sham needs and that what they really need is redemption, justification, and sanctification. I've got to meet people's needs on the terms previously defined by God: urging repentance, faith, prayer, and a growing knowledge of the Lord Jesus. 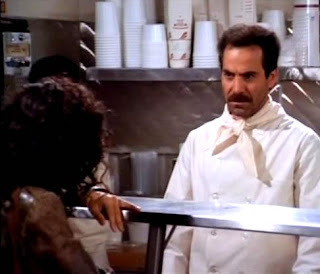 So hey, pastors, channel the courage of the Soup Nazi! You know what people's needs are, you have the knowledge of the path of Life. Stop trying to identify "felt needs" and get on with gospel ministry! And, don't forget to hang a picture of the Soup Nazi on your wall; perhaps it'll give you that added chutzpah the next time a disgruntled customer, errr...parishioner, steps into your office. someone has been reading some Shane Hipps possibly? great post, Matt! peace to you. Great post! May I recommend a book that fits well with your thesis? The book is: "A Failure of Nerve: Leadership in the Age of the Quick Fix," by Ed Friedman. Fantastic stuff!